SIS LIVE collaborate with Broadcast Sports, Inc. (BSI) on ManPak®100. April 2014, Milton Keynes, United Kingdom: Satellite product design specialist SIS LIVE and wireless technologies expert Broadcast Sports, Inc. (BSI) have collaborated on SIS LIVE’s latest cutting edge VSAT product, ManPak®100. 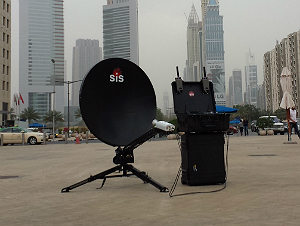 SIS LIVE has developed an innovative tripod style satellite terminal, integrated with BSI’s market leading Real Freedom™ COFDM platform. This system allows ManPak®100 units to capture live video feeds from a camera transmitter from a radius of approximately 1.5km via a small COFDM transmitter mounted on a camera and integral receiver located within the ManPak®100 terminal. This source can then be transmitted via a Ka or Ku band satellite of choice back to base. The integrated COFDM receiver means that no cabling is required to connect to a camera, giving users the Real Freedom™ to capture images from mobile sources which could include everything from HD broadcast cameras, miniature body-worn cameras, to airborne drone EO/IR cameras. The integration of these two cutting-edge technologies provides all the necessary connectivity in one ruggedised, waterproof package, with no decoding / recoding required from camera through to destination. The ManPak®100 leads the way in the next generation of satellite terminals. This 1m and 1.2m antenna comes with a revolutionary control case which makes the acquisition of satellites simple, even for non-technical users, through the use of two simple wheels controlling the azimuth and elevation, and an award winning graphical user interface (GUI). ManPak®100 also features a connection and integrated housing for a high-grade encryption device. ManPak®100 is low-cost, incredibly quick to deploy, and can be on a satellite in less than 5 minutes.